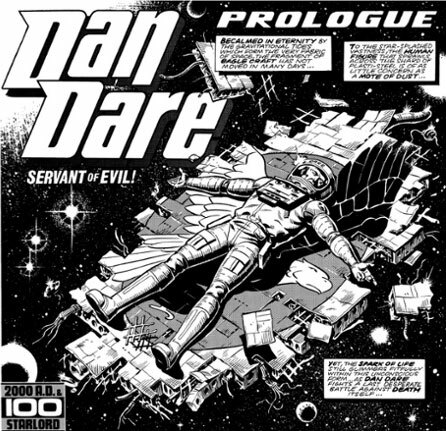 A blast from the past is about to shower us in a meteorite-like fashion with the reprinting of the ‘quintessentially British’ comic strip Dan Dare. Bloody good ol’ sport. Dan Dare will be turning a glorious senior citizen of 65 years next year, and 2000 A.D. plans to publish never-before-reprinted strips from the 1970’s comic. This ‘Pilot of the Future’ was created by Frank Hampson and made it’s debut in the pages of the Eagle Comics back in the 1950’s. Dan Dare’d go space traveling, exploring new worlds while parrying off danger fighting his arch-nemesis Mekon. The comic went on a hiatus in 1969, but was brought back by 2000 AD Weekly Comics which lasted until 1979. The comic strip at first was illustrated by Italian artist Massimo Belardinelli, and later by Dave Gibbons. Dave Gibbons soon after that went on to work with Alan Moore on Watchmen. The Dan Dare strip ran until 1979. Very pulpy, a true testament to the influx of similar titles in the Action / Adventure Comic era, where the Sci-Fi had fast become the new Western. Fans and the intrigued can expect two series to be available come fall, featuring five main stories comprising of 47-episodic features, in addition to six standalone narratives. Karl Urban could very well return as Judge Dredd for “Mega City One” TV series. Is “Injustice 2” bringing “Watchmen” characters into the fold?